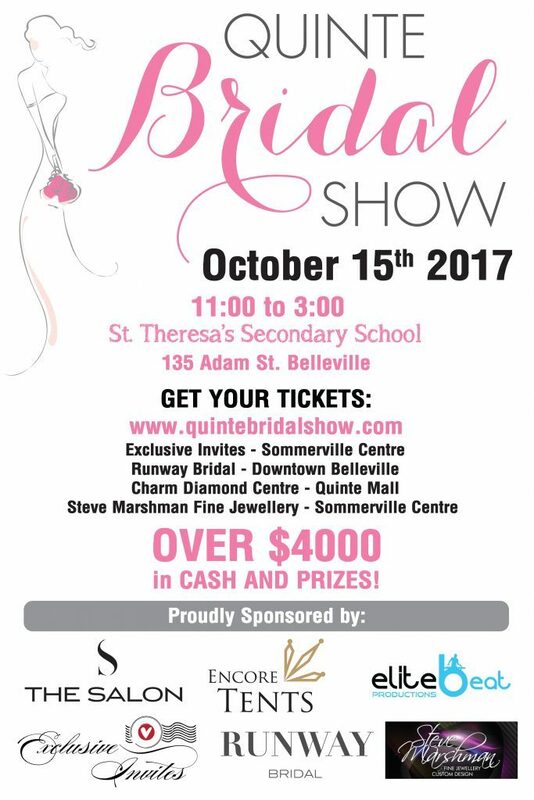 2017 is host to the 10th annual Quinte Bridal Show, and over the years the show has evolved into the largest and most talked about Bridal Show in the Quinte and surrounding areas. Preferred by Couples and Wedding Professionals. Together Amber and Brooke have been collaborating on the Quinte Bridal show to bring the areas couples variety and quality vendors to choose from. This years show is hosted in Belleville, Ontario and welcomes over 75 professionals, great prizing and 150 free Bridal Swag Bags. Be sure to plan your day as all prizing will be drawn from 2:30pm-3:00pm and you must be there to win. Be sure to take photos and tag the show with #qbs2017. The Quinte Bridal show is a proud winner of the South Eastern Ontario Wedding Award 2016 for best Bridal Show. The Belleville Wedding Show October 2017 is a must-attend event this year! You will get the chance to win over $4,000 in cash and prizes this year too, so don’t miss out!